The agency can approve events to be published for web. Once approved, the events appear within 30 minutes in the event API. An example of an API can be found here. If you're a developer, contact System One support to get access to the API for your agency. Localize the day, month names in the response. Filters the response by artist. Filters the response by production. 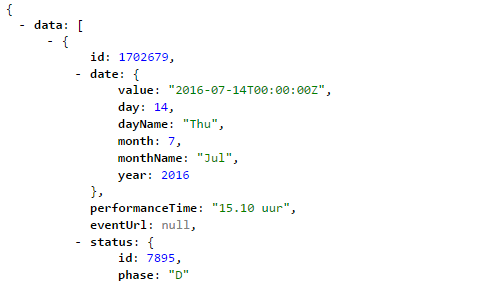 Depending on the API configuration, most API's never display events that are cancelled or in option. Node only shows when a tickets URL is specified. Some agencies use a productions module. Events belong to a certain production. LPT: We found the Chrome JSONView plugin a useful tool to quickly inspect JSON output.